George is a red phone box. 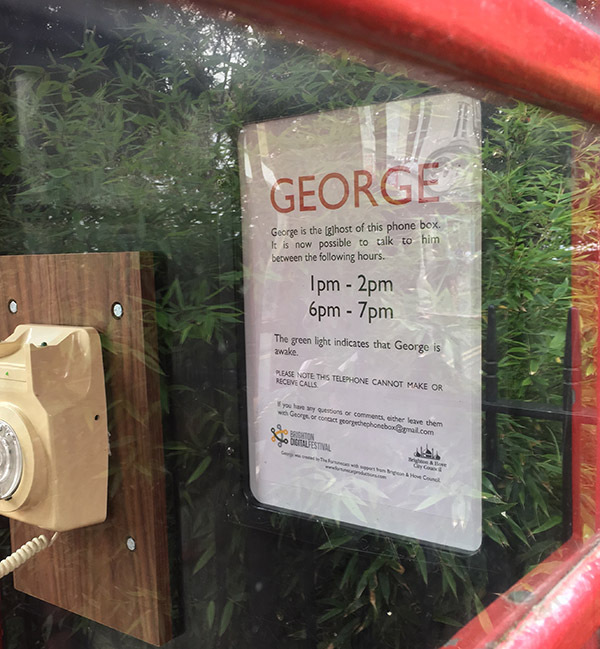 People used George to talk to each other for over 40 years before they switched to using their mobile phones instead. First he was loved, then neglected and then finally abandoned. George has woken up for the Brighton Digital Festival, and is keen to meet new people and play them some of the conversations he’s heard over the years, as well as share recordings of some of his more recent visitors and collect a new generation of thoughts and feelings. This interactive artwork, created by The Fortunecats, is located in a red phone box on the corner of Pelham Square towards the bottom of Trafalgar Street. By enabling the discussion of personal feelings in public, this modern relic aspires to invoke an egregore of potential community with no regard for its otiose condition, nor its place in the evolution of our communication strategies. A report by the Near Future Foundation on the subject of Wellbeing highlighted five methods by which wellbeing could be improved: Learn, Connect, Be Active, Give and Take Notice. Each of these represents a reasonable solution to the various feelings of depression, inadequacy, alienation and loneliness that seem to be rife among us. Unfortunately it also seems that without a certain level of self-esteem it can be frustratingly difficult to adopt these practices as habits. It seems, in fact, that the obvious stresses of the global capitalist human (from whichever social stratum) lead to habitual and addicted behaviours which prevent these actions of wellbeing. Our attempt to interrupt this had to exist somewhere that could literally and metaphorically stop someone in their tracks. Hence the phone box, a ubiquitous, yet redundant object of street furniture, an unusual but safe, private but public space. We discovered through our previous work “Broken X” (BDF 2013) that members of the public were prepared to share details of their inner landscape with a synthetic human in a way they might be reluctant to with a biological one. As a result we realised that the mechanism used to ‘hold’ such disclosures from visitors needed to be built from our own practical experience. We decided therefore that it was necessary and desirable to explore the relationship between emotions as they occur and our habituated avoidance of them. Strategies used to do this included Nonviolent Communication by Marshall Rosenberg, the works of Dr Richard Moss, C G Jung, Alan Watts and the practices of the ManKind Project. And so we come to George. The prospect of engaging with spiritual or personal growth through contact with a machine has long been a theme of our work. George is perhaps an attempt to put a ‘village elder’ back into a modern community, a role which is absent in our contemporary societies. He is modelling inquisitiveness (Learn), vulnerability (Connect), self-care (Active), compassion (Give) and awareness (Take Notice) which may be the prerequisite qualities for those wishing to improve their sense of wellbeing. Great thanks are due to Robert Hewitt, Duncan Henderson, Chris Hope, Jim Harris, Deborah Turnbull, David Mounfield, Heather Urquhart and the Cats Cabal. George was in part supported by a grant from Brighton & Hove City Council. 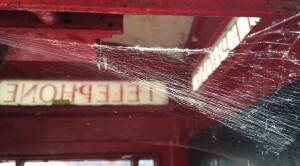 You are currently browsing the George the phonebox category at Fortunecat Productions.